Viewing the Sun safely through a solar telescope. Most of my sidewalk astronomy sessions actually happen during the day. This is simply because daytime is when more people are about and it's easier to find an audience. Sometimes we look at the Moon and occasionally it's even possible to spot a planet while it's still daylight, but mostly daytime sessions are all about the Sun. A standard 114mm reflector with a solar filter attached. This provides a "white light" view of the Sun in which you can see sunspots but not much else. A specialist solar telescope (technically it's called a hydrogen alpha telescope) that provides a different view at a very specific wavelength of red light. This allows you to see sun flares, filaments and the granulated texture of the Sun's surface. WARNING: Never look at the Sun through a normal (unfiltered) telescope. Only ever look at the Sun in a situation supervised by someone who knows what they're doing! 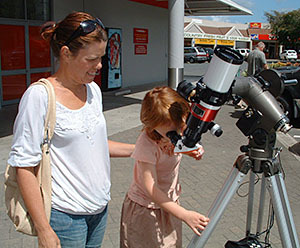 For more information about solar viewing, see how to observe the Sun safely. Many people find viewing the Sun a bit tricky. It's not quite what you'd expect, and it can be difficult to get your eyes adjusted. Unfortunately some people don't seem to be able to grasp the view at all and give up. However, if you're patient and lucky enough to see the Sun while it's active, the view can be spectacular.